East Tennessee comprises approximately the eastern third of the U.S. state of Tennessee, one of the three Grand Divisions of Tennessee defined in state law. East Tennessee consists of 33 counties, 30 located within the Eastern Time Zone and three counties in the Central Time Zone, namely Bledsoe, Cumberland, and Marion. East Tennessee is entirely located within the Appalachian Mountains, although the landforms range from densely forested 6,000-foot (1,800 m) mountains to broad river valleys. The region contains the major cities of Knoxville, Chattanooga, and Johnson City, Tennessee's third, fourth, and ninth largest cities, respectively. East Tennessee is both geographically and culturally part of Appalachia, and has been included— along with Western North Carolina, North Georgia, Eastern Kentucky, Southwest Virginia, and the state of West Virginia— in every major definition of the Appalachian region since the early 20th century. East Tennessee is home to the nation's most visited national park— the Great Smoky Mountains National Park— and hundreds of smaller recreational areas. East Tennessee is often called the birthplace of country music, due largely to the 1927 Victor recording sessions in Bristol, and throughout the 20th and 21st centuries has produced a steady stream of musicians of national and international fame. Oak Ridge was the site of the world's first successful uranium enrichment operations which paved the way for the atomic age. The Tennessee Valley Authority, created to spur economic development and help modernize the region's economy and society, has its administrative operations headquartered in Knoxville and its power operations headquartered in Chattanooga. Unlike the geographic designations of regions of most U.S. states, the term East Tennessee has legal as well as socioeconomic meaning. East Tennessee, along with Middle Tennessee and West Tennessee, comprises one of the state's three Grand Divisions. According to the Tennessee State Constitution, no more than two of the Tennessee Supreme Court's five justices can come from any one Grand Division. The Supreme Court rotates meeting in courthouses in each of the three divisions. The Supreme Court building for East Tennessee is in Knoxville. A similar rule applies to certain other commissions and boards as well, to prevent them from showing a geographic bias. 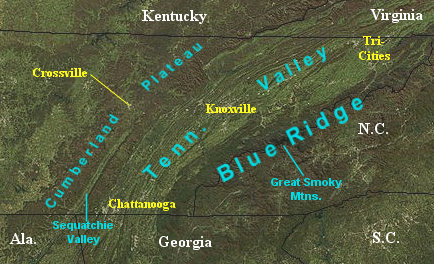 East Tennessee includes parts of three major geological divisions— the Blue Ridge on the border with North Carolina in the east, the Ridge-and-Valley Appalachians (usually called the "Great Appalachian Valley" or "Tennessee Valley") in the center, and the Cumberland Plateau in the west, bordering Middle Tennessee. The Blue Ridge section comprises the western (or "Unaka") section of the Blue Ridge Province, the crest of which forms most of the Tennessee-North Carolina border and consists of the highest parts of the state (including Clingmans Dome, the state's highest point). The Blue Ridge is subdivided into several subranges— the Iron Mountains, Roan Highlands, and Bald Mountains in the north, the Great Smoky Mountains in the center, and the Unicoi Mountains and Little Frog and Big Frog Mountain areas in the south. Most of the Blue Ridge section is heavily forested and protected by various state and federal entities, the largest of which include the Great Smoky Mountains National Park and the Cherokee National Forest. The Cumberland Plateau rises nearly 1,000 feet (300 m) above the Tennessee Valley, stretching from Cumberland Gap at the Tennessee-Kentucky-Virginia border southwestward to the Alabama border. The "Tennessee Divide" runs along the western part of the plateau, and separates the watersheds of the Tennessee and Cumberland rivers. Plateau counties mostly east of this divide— i.e. Cumberland, Morgan, and Scott— are grouped with East Tennessee, whereas plateau counties west of this divide (Fentress, Van Buren, and Grundy) are considered part of Middle Tennessee. Three counties— Bledsoe, Sequatchie, and Marion— are located in the Sequatchie Valley, a long narrow valley in the southern part of the Cumberland Plateau. These three counties were traditionally part of East Tennessee. However, Sequatchie and Marion counties were reassigned to the Middle Tennessee grand division circa 1932. Marion County was later returned to East Tennessee, but Sequatchie County officially remains part of Middle Tennessee. One notable detached section of the Plateau is Lookout Mountain, which overlooks Chattanooga. The Official Tourism Website of Tennessee has a definition of East Tennessee slightly different from the legal definition. : The website excludes Cumberland County while including Grundy and Sequatchie Counties. The major cities of East Tennessee are Knoxville (near the center of East Tennessee), Chattanooga (in southeastern Tennessee at the Georgia border), and the "Tri-Cities" of Bristol, Johnson City, and Kingsport located in the extreme northeasternmost part of the state. The Blue Ridge section of the state is much more sparsely populated, its main cities being Elizabethton, Gatlinburg, and Tellico Plains. Crossville and Jasper are prominent cities in the Plateau region. Much of what is known about East Tennessee's prehistoric American Indians comes as a result of TVA's reservoir construction, as federal law required archaeological investigations to be conducted in areas that were to be flooded. Excavations at the Icehouse Bottom site near Vonore revealed that American Indians were living in East Tennessee on at least a semi-annual basis as early as 7,500 B.C. The region's significant Woodland period (1000 B.C. – 1000 A.D.) sites include Rose Island (also near Vonore) and Moccasin Bend (near Chattanooga). During what archaeologists call the Mississippian period (c. 1000–1600 A.D.), East Tennessee's American Indian inhabitants were living in complex agrarian societies at places such as Toqua and Hiwassee Island, and had formed a minor chiefdom known as Chiaha in the French Broad Valley. Spanish expeditions led by Hernando de Soto, Tristan de Luna, and Juan Pardo all visited East Tennessee's Mississippian-period inhabitants during the 16th century. By the time English explorers began arriving in what is now East Tennessee in the late 17th century, the Cherokee had become the region's dominant tribe. The Cherokee established a series of towns concentrated in the Little Tennessee and Hiwassee valleys that became known as the "Overhill towns", as traders from North Carolina, South Carolina, and Virginia had to cross "over" the mountains to reach them. The Cherokee alliance with Britain during the French and Indian War led to the construction of Fort Loudoun in 1756. A peace expedition led by Henry Timberlake in 1761 provided later travelers with invaluable knowledge regarding the location of the Overhill towns and the customs of the Overhill Cherokee. In 1775, a faction of Cherokees led by Dragging Canoe— angry over the tribe's appeasement of European settlers— split off to form what became known as the Chickamauga faction, which was concentrated around what is now Chattanooga. In spite of Dragging Canoe's protests, the Cherokee were continuously induced to sign away most of the tribe's lands to the U.S. government in a series of treaties between 1775 and 1836. The last such treaty resulted in the tribe's tragic removal to Oklahoma via the Trail of Tears in 1838. During the American Revolution, the Wataugans supplied 240 militiamen (led by John Sevier) to the frontier force known as the Overmountain Men, which defeated British loyalists at the Battle of Kings Mountain. Tennessee's first attempt at statehood was the State of Franklin, formed in the 1780s with its capital initially at Jonesborough and later Greeneville, but the state was never admitted by Congress. The Southwest Territory, which encompassed much of what is now Tennessee and Kentucky, was created in 1790 with William Blount as its first governor. Blount and James White established the city of Knoxville as the territory's capital. Knoxville would later serve as Tennessee's first capital. The vast majority of 18th century settlers were English or of primarily English descent but nearly 20% of them were also Scots-Irish. Today, most people in East Tennessee are still of mostly English ancestry with some also claiming to be of Scots-Irish ancestry. The arrival of the railroad in the 1850s brought immediate economic benefits to East Tennessee, primarily to Chattanooga, which had been founded in 1839. Chattanooga quickly developed into a nexus between the mountain communities of Southern Appalachia and the cotton states of the Deep South, being referred to as the Gateway to the Deep South. Chattanooga's strategic position made it one of the most active theaters of the Civil War, as Confederate armies considered the city vital for supply lines between Virginia and the Deep South. The Civil War sentiments of East Tennessee were among the most complex of any region in the nation. Whig support ran high in East Tennessee (especially in Knox and surrounding counties) in the years leading up to the war, as many people in the region were suspicious of the aristocratic Southern planter class that dominated the Southern Democratic party and most southern state legislatures. When Tennessee voted on a referendum calling for secession in February 1861, more than 80% of East Tennesseans voted against it, including majorities in every county except Sullivan and Meigs. In June 1861, nearly 70% of East Tennesseans voted against the Ordinance of Secession (which succeeded statewide), although along with Sullivan and Meigs, there were pro-secession majorities in Monroe, Rhea, Sequatchie, and Polk counties. There were also pro-secession majorities within the cities of Knoxville and Chattanooga, although these cities' respective counties voted decisively against secession. In June 1861, the Unionist East Tennessee Convention met in Greeneville, where it drafted a petition to the Tennessee state legislature demanding that East Tennessee be allowed to form a separate Union-aligned state split off from the rest of Tennessee (à la West Virginia). The legislature rejected the petition, however, and Tennessee Governor Isham Harris ordered Confederate troops to occupy East Tennessee. Senator Andrew Johnson and Congressman Horace Maynard— who in spite of being from a Confederate state retained their seats in Congress— continuously pressed President Abraham Lincoln to send troops into East Tennessee, and Lincoln subsequently made the liberation of East Tennessee a top priority. Knoxville Whig editor William "Parson" Brownlow, who had been one of slavery's most outspoken defenders, attacked secessionism with equal fervor, and embarked on a speaking tour of the Northern states to rally support for East Tennessee. Union troops did not secure Knoxville until late 1863, however, and Chattanooga was only secured after a series of bloody campaigns late in the same year in a pivotal moment for the Civil War, which came to be known as the Chattanooga Campaign. Over a period of two decades, the Tennessee Valley Authority, created in 1933 at the height of the Great Depression, drastically altered the economic, cultural, and physical landscape of East Tennessee. TVA sought to build a series of dams across the Tennessee River watershed to control flooding, bring cheap electricity to East Tennessee, and connect Knoxville and Chattanooga to the nation's inland waterways by creating a continuously navigable channel along the entirety of the Tennessee River. Starting with Norris Dam in 1933, the agency built 10 dams in East Tennessee (and five more across the border in North Carolina and Georgia) over a period of two decades. Melton Hill and Nickajack were added in the 1960s, and the last, Tellico Dam, was completed in 1979 after a contentious five-year legal battle with environmentalists. TVA also gained control of TEPCO's assets after a legal struggle in the 1930s with TEPCO president Jo Conn Guild and attorney Wendell Willkie that was eventually dismissed by the U.S. Supreme Court. East Tennessee's physiographic layout and rural nature made it the ideal location for the uranium enrichment facilities of the Manhattan Project— the federal government's top secret World War II-era initiative to build the atomic bomb. Starting in 1942, the U.S. Army Corps of Engineers built what is now the city of Oak Ridge, and the following year work began on the enrichment facilities, K-25 and Y-12. During the same period, Tennessee Eastman built the Holston Ordnance Works in Kingsport for the manufacture of an explosive known as Composition B. The ALCOA corporation, seeking to meet the wartime demand for aluminum (which was needed for aircraft construction), built its North Plant, which at the time of its completion was the world's largest plant under a single roof. To meet the region's skyrocketing demand for electricity, TVA hastened its dam construction, completing Cherokee and Douglas dams in record time, and building the massive Fontana Dam just across the state line in North Carolina. Appalachian music has evolved from a blend of English and Scottish ballads, Irish and Scottish fiddle tunes, African-American blues, and religious music. In 1916 and 1917, British folklorist Cecil Sharp visited Flag Pond, Sevierville, Harrogate, and other rural areas in the region where he transcribed dozens of examples of "Old World" ballads that had been passed down generation to generation from the region's early English settlers. Uncle Am Stuart, Charlie Bowman, Clarence Ashley, G. B. Grayson, and Theron Hale were among the most successful early musicians from East Tennessee. In 1927, the Victor Talking Machine Company conducted a series of recording sessions in Bristol that saw the rise of musicians such as Jimmie Rodgers and the Carter Family. Subsequent recording sessions, such as the Johnson City sessions in 1928 and the Knoxville St. James Sessions in 1930 proved lucrative, but by the late 1930s, the success of the Grand Ole Opry had lured much of the region's talent to Nashville. In the 1940s, the Grand Ole Opry and associated music labels began using "country" instead of "hillbilly" for their genre, hoping to attract a wider audience. In the early 1930s, entrepreneurs established tourist attractions at Rock City and Ruby Falls on Lookout Mountain, perhaps best known for their unique advertisements painted on barn roofs across the southeast. TVA considered the creation of recreational opportunities along its reservoirs a priority, and reservoirs such as Norris Lake and Chickamauga Lake have since grown into hunting and fishing meccas. The agency was also responsible for the creation of state parks such as Big Ridge State Park and Harrison Bay State Park. Knoxville hosted the 1982 World's Fair, which drew over 11 million visitors, making it one of the most popular world's fairs in history. In the early 1990s, the Tennessee Aquarium— one of the world's largest freshwater aquariums— opened in Chattanooga. The Tennessee Aquarium coincided with the revitalization of Chattanooga's riverfront, which helped to bolster the downtown districts. With the downtown districts joining the other attractions located in Hamilton County, the county surpassed $1 billion in tourism revenue, a first for the large cities in East Tennessee. The city has become an outdoor sports mecca, being heralded as the "Best Town Ever" by Outside magazine. The Ballad of Davy Crockett helped to popularize the 1955 film Davy Crockett, King of the Wild Frontier. First recorded and introduced on the television series Disneyland in 1954, it has been covered by a number of artists, most notably Tennessee Ernie Ford. The song's lyrics say Crockett was "born on a mountaintop in Tennessee", but his actual birthplace was Limestone, Tennessee, the home of Davy Crockett Birthplace State Park. In addition to his renowned frontier exploits and military service, Crockett served Tennessee as a state legislator and Congressman. The folk hero Daniel Boone, who helped explore East Tennessee, was honored in the soundtrack for the television series Daniel Boone, which ran from 1964 until 1970. The last of three versions of the theme song was sung by The Imperials, a Grammy-winning Christian music group. Christy, a 1990s CBS television series, was based on village life in 1910s East Tennessee. The show, which was later developed into a television movie series, featured traditional mountain music. "ChristyFest", held each summer, is dedicated to the novel, musical, TV series, and movies, and includes live folk music. The television film Dolly Parton's Coat of Many Colors, aired on NBC in 2015. The film was inspired by her 1971 song and album of the same name, and recounts her childhood in the mountains of Tennessee. The film was generally praised by critics, and received the Tex Ritter Award from the Academy of Country Music. Throughout the 19th and early 20th centuries, rural East Tennessee's economy relied heavily on subsistence agriculture. Agriculture still plays a vital role in Tennessee's economy, such as Grainger County's renowned tomatoes. 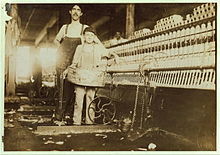 In the cities, however, manufacturing was the main source of prosperity and growth. By 2000, just over 1% of the region's population was employed in agriculture or related industries. As of the 2000 census, manufacturing accounted for roughly 20% of region's jobs, with the largest employers being the Tennessee Valley Authority (based in Knoxville with 12,893 full-time workers), Eastman Chemical in Kingsport (10,000 employees), Sea Ray in Knoxville (3,500 employees), Denso Manufacturing in Maryville and Athens (over 3,000 employees), and Pilot Flying J in Knoxville (with over 550 location nationwide). Health and education services accounted for another 20% of the region's jobs, with major employers being Bluecross-Blueshield of Tennessee (4,144 employees), the Baptist Hospital system in Knoxville (4,000 employees), and the Tennessee Department of Health in Chattanooga (4,000 employees). Tourism and recreational industries account for just under 10% of East Tennessee's workforce, the primary attractions being the Great Smoky Mountains National Park (9 million visitors per year), the Tennessee Aquarium in Chattanooga (one million visitors per year), Zoo Knoxville (over 400,000 visitors per year), and historical sites such as the Museum of Appalachia and Rugby. Other significant employers included the Chattanooga trucking firms U.S. Xpress (8,100 employees) and Covenant Transportation (5,000 employees), and the Y-12 facility in Oak Ridge (4,750 employees). Mussel shoals in the upper Tennessee River valley, mainly above Knoxville, constitute the only important source of freshwater pearls in the United States. The Tennessee Valley Authority, with administrative operations headquartered in Knoxville and power operations headquartered in Chattanooga, provides most of the region's electricity via its hydroelectric dams as well as coal-fired plants near Kingston, a gas-fired plant near Rogersville, the Sequoyah and Watts Bar nuclear plants, the Raccoon Mountain Pumped-Storage Plant, and a wind-powered facility atop Buffalo Mountain near Oak Ridge. In recent years, TVA's effectiveness has been debated, with some arguing it saved East Tennessee from a bleak future, and others claiming the agency is a mismanaged, wasteful bureaucracy. With the expanded smart grid in Chattanooga, and the fastest internet in the Western Hemisphere, Chattanooga has begun to grow its technical and financial sectors due to its burgeoning start-up scene. The Appalachian Regional Commission was formed in 1965 to aid economic development in the Appalachian region, which was lagging far behind the rest of the nation on most economic indicators. The Appalachian region currently defined by the Commission includes 420 counties in 13 states, including all counties in East Tennessee. The Commission gives each county one of five possible economic designations— distressed, at-risk, transitional, competitive, or attainment— with "distressed" counties being the most economically endangered and "attainment" counties being the most economically prosperous. These designations are based primarily on three indicators— three-year average unemployment rate, market income per capita, and poverty rate. In 2003, "Appalachian" Tennessee— which included all of East Tennessee and the easternmost counties in Middle Tennessee— had a three-year average unemployment rate of 4.9%, compared with 5.6% statewide and 5.5% nationwide. In 2002, Appalachian Tennessee had a per capita market income of $19,936, compared with $20,422 statewide and $26,420 nationwide. In 2000, Appalachian Tennessee had a poverty rate of 14.2%, compared to 13.6% statewide and 12.4% nationwide. In 2014, ten East Tennessee counties— Bledsoe, Campbell, Cocke, Greene, Hancock, Johnson, Meigs, Monroe, Scott, and Van Buren— were designated "distressed," while eleven— Carter, Claiborne, Cumberland, Grainger, Jefferson, McMinn, Morgan, Polk, Rhea, Unicoi, and Union— were designated "at-risk." No counties in East Tennessee were given the "competitive" or "attainment" designations, and the remaining 12 counties were designated "transitional". Hancock had East Tennessee's highest poverty rating, with 29.4% of its residents living below the poverty line. Knox had East Tennessee's highest per capita income ($25,999) and the lowest unemployment rate (2.8%), although Hamilton was a close second on both of these indicators. The University of Tennessee's athletic teams, nicknamed the "Volunteers," or "Vols", are the region's most popular sports teams, and constitute a multimillion-dollar industry. The university's football team plays at Neyland Stadium, one of the nation's largest stadiums. Neyland is flanked by the Thompson–Boling Arena, which has broken several attendance records for college men's and women's basketball. East Tennessee Republican leanings are rooted in its antebellum Whig sentiments (historian O.P. Temple actually traces this sentiment back to the anti-aristocratic Covenanters of Scotland). As in much of Southern Appalachia, the region's yeoman farmers clashed with the large-scale planters and business interests that controlled the Democratic Party and dominated most southern state legislatures. East Tennesseans revered the likes of John Sevier and Davy Crockett, and were drawn to the political philosophies of Henry Clay and Daniel Webster. They tended to reject the policies of the Southern Democrats, who were deemed "aristocratic" (Andrew Jackson's popularity in the Chattanooga area— which he helped open to European-American settlement— created a stronger Democratic base in southeastern Tennessee, however). In the early 1840s, then-state senator Andrew Johnson actually introduced a bill in the state legislature that would have created a separate state in East Tennessee. The Radical Republican post-war policies of Governor William "Parson" Brownlow greatly polarized the state along party lines, with East Tennesseans mostly supporting Brownlow and Middle and West Tennesseans mostly rejecting him. The Southern Democrats regained control of the state government in the early 1870s, but Republican sentiment remained solid in East Tennessee, especially in the 1st and 2nd Districts. By the 1880s, the state's Democrats had an unwritten agreement with the state's Republicans whereby Republicans would split presidential patronage of Republican presidencies with the Democrats so long as the Democrats allowed them continued influence in state affairs. In 1888, Pennsylvania-born Henry Clay Evans was elected to the congressional seat for the 3rd District (the Chattanooga area). Evans, who rejected compromise and the splitting of presidential patronage with the state's Democrats, strongly supported a bill that would have turned over control of state elections to the federal government. In response, the state legislature gerrymandered the 3rd District, ensuring Evans' defeat in 1890. After 1901, more than a half-century passed without the state legislature redistricting, in spite of population shifts. In 1959, Memphis resident Charles Baker sued the legislature in hopes of forcing it to redraw the districts, culminating in the landmark U.S. Supreme Court case Baker v. Carr. In the decades after this case, the 3rd District has been redrawn several times, and a new 4th District was carved in part out of the 1st, 2nd and 3rd Districts. The 2000s round of redistricting made the 3rd more Republican and the 4th more Democratic. After the 2010 elections and the redistricting before 2012, though, the Republicans in control of state government made both the 3rd and 4th Districts significantly more Republican, and both are now on paper among the most Republican districts in the country.